You are currently browsing the tag archive for the ‘tree loss’ tag. 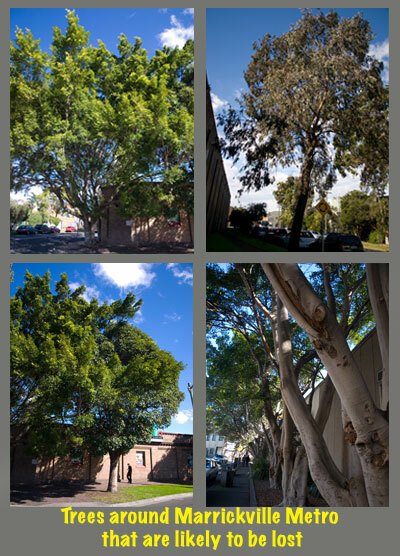 This week I counted the following trees around the current Marrickville Metro & the block where they intend to expand. 67 Fig trees, 9 Brush Box trees, 3 Camphor laurel trees, 8 Eucalypts, 4 Palm trees, 1 Canary Island Palm, 2 Melaleuca trees, 8 Bottlebrush trees, 4 Peppercorn trees, 10 Wattle trees & 26 unidentified species of trees. There are another 24 medium trees on site that may be included in the development bringing the potential total tree loss to 166 trees. 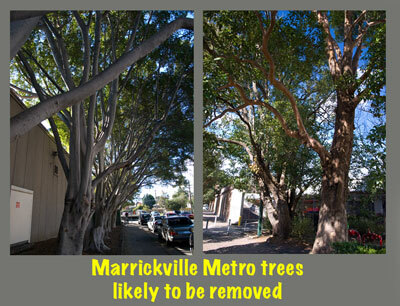 Just some of the trees at risk of removal if the Marrickville Metro expansion goes ahead. The trees create a lovely ambience around the Metro, collect air pollution from vehicles, bring significant beauty to the area, sequester large amounts of CO2, help to lessen the Heat Island Effect & provide homes & food for urban wildlife. Their loss will be devastating. 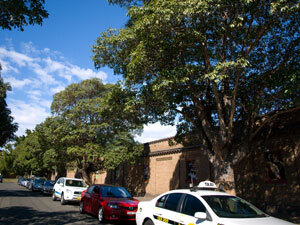 AMP Capital say the Fig trees only have an average 5-15 years left to live. In ideal conditions, Figs live 150-200 years. Although these trees are not in ideal conditions they are very healthy. To replace the trees they plan to plant 28 Eucalyptus paniculata (Grey Ironbark) along Murray Street & low level accent, grass & groundcovers “to ensure that general safety, sightlines & CPTED principals are maintained.” – meaning all signs & the building will be very visible as if the height of the new buildings is not enough. 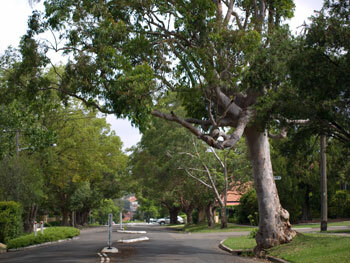 More of the trees at risk of removal. I think losing these trees will be a huge loss for the community, for air quality, for beauty of the area & for urban wildlife. 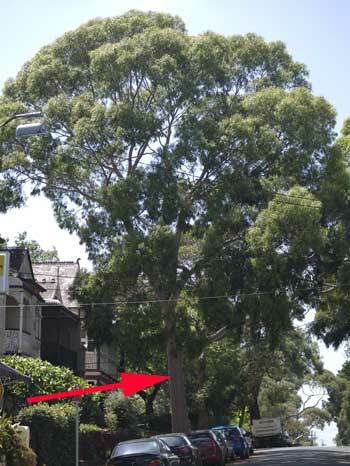 Currently most of Marrickville Metro is hidden behind large beautiful, healthy trees. I cannot imagine the area without them. Most of these trees are mature & took decades to grow. The Metro expansion will also result in a 65-68% increase in traffic from an estimated extra 4 million customers a year. It will destroy our local shopping strips & remove much of the individual kind of shop that make the Inner West unique. 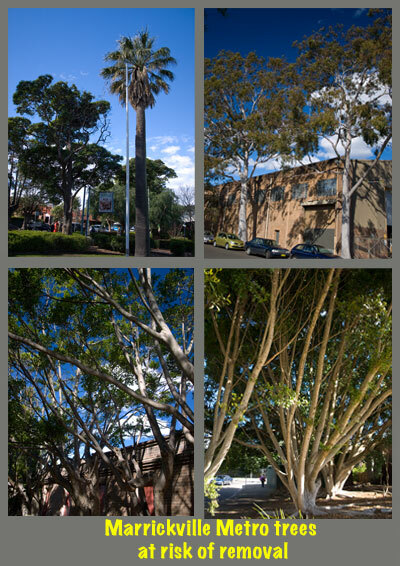 In return for traffic gridlocked streets, parking problems, much more noise, air pollution, visual pollution & the potential loss of at least 142 beautiful trees, AMP Capital will give us many more shops like we can get at close-by Roselands, Eastgardens or Broadway shopping malls. They are also offering a small library & a community education board. We already have a number of fabulous & free-to-use libraries courtesy of Marrickville Council & a public education board is nothing to get excited about. 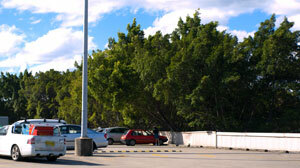 The car park of Marrickville Metro is surrounded by the canopy of the Figs & other trees providing a buffer to surrounding properties & creating an ambience unknown anywhere else in Sydney. They also prevent particulate matter (known to cause lung & heart disease) from the vehicles from dropping onto the street & surrounding properties. The expansion to double the size of the current Metro makes me wonder where the customers are going to come from. Around 2-3 years ago, all the shops in Metro were required to do a specific renovation as part of sprucing up Metro & their rents were raised. A number of shops were struggling to meet this cost & some moved out to set up shop elsewhere. Since then, there have always been vacant shops in Marrickville Metro. I am of the belief that AMP Capital would not be investing millions to do the expansion if they weren’t absolutely sure they will make bucket-loads of money. Right now the area is classified as a village, but if the expansion goes ahead, the Department of Planning may be within their rights to reclassify the area as a ‘Town Centre’ simply because of the size of Marrickville Metro. This will mean that development in the league of Bondi Junction & Hurstville will be allowed. It doesn’t take much imagination to see the industrial-zoned areas around Metro being rezoned residential. Once that is done, a ‘unit city’ can be built very close to Metro. Then, to cope with the massive increase in traffic, the M6, an arterial road that is planned for Edgeware Road may one day be built. Edgeware Road is already often bumper-to-bumper. 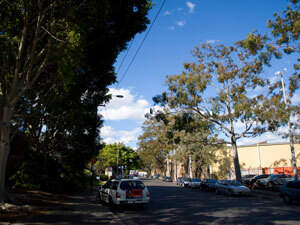 The Marrickville Transport Action Group say – Cardigan St, Edgeware Rd, Liberty St & Kingston Rd are key to the F6 plan. Who knows if my theories have any weight, but it does make more sense as to why such a huge shopping mall is being planned when there are not enough current customers & it constantly has a number of empty shops. it will take away the community feeling that shopping strips help create, because these are public spaces where we retain all our rights as citizens, whereas shopping malls are private spaces under the control of developers/corporations. Unless the community come out in great numbers & say they do not want the Metro expansion, it will happen. It is called Major Project – MP_0191 – 34 Victoria Road Marrickville. If you would like a draft submission please send me an e-mail.